… I thought this was a well known fact, but apparently my sweet Mama made it up. Today I celebrated my one year anniversary at work, but technically, I worked with the organization from 2003 to 2005 and then volunteered in between then and when I came back last July, so really I’ve been around for three years professionally and five years overall. Anyway … appropriately, to celebrate my anniversary, the staff surprised me with a cake in the shape of … you guessed it – a big, honkin’ cupcake! Can I get an AMEN!?! 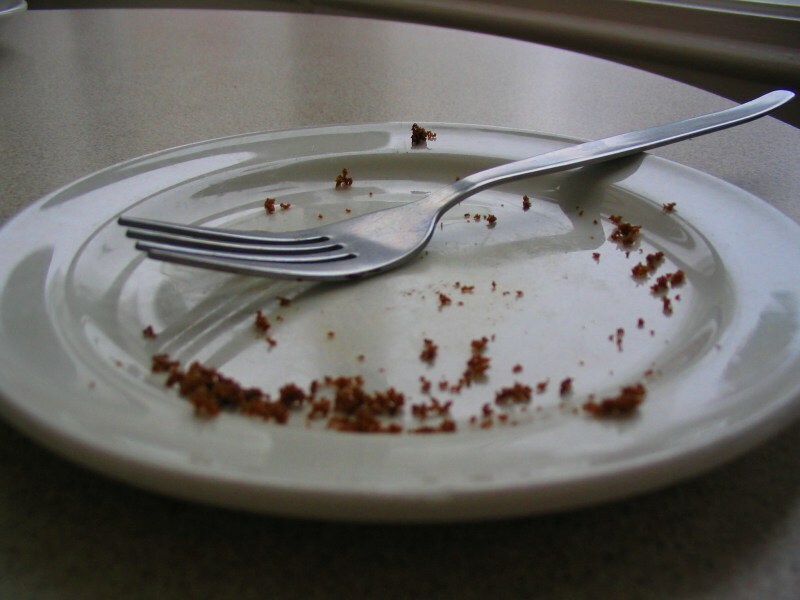 After devouring a slice, I realized there were some lonely crumbs sitting on the doily that were just screaming to be eaten, and since my Mama always told me “crumbs don’t have calories,” I figured the only right thing to do would be to eat them. After all, waste not, want not. I mentioned this crumb theory to one of the office interns and she totally rained on my parade, telling me how crazy I was (which, I am) for saying such a thing. But isn’t it kind of like Santa or the Tooth Fairy or just the simple power of suggestion? If I think the crumbs don’t have calories than they must not – right? Or maybe I want to believe it so badly because it’s something my mother taught me. My wonderful mother passed away earlier this year, and I miss her madly. Not a day goes by that I don’t think of her and at least come close to shedding a tear or lots of them. But I can hold onto all of the wonderful things we shared, like her silly theories, and all the times that we spent eating cupcakes together. Perhaps she’s the reason why I love cupcakes so much. I worked for a PR agency in the city for a year and during that time I brought home cupcakes, at her request of course, to taste test from the likes of Buttercup, Magnolia, Junior’s, Zaro’s, Cupcake Cafe and Crumbs. It was a tough job, but we were up for the task. Really, we felt a responsibility of sorts to mankind, okay, so that might be stretching it, but we at least felt a responsibility to our family and friends to be connoisseurs of cupcakes and have the ability to make appropriate recommendations for a variety of occasions. Of course I know it’s not true. I’m not quite as dumb as I look, but I choose to believe that crumbs don’t have calories because the theory works for me. Okay, so maybe it doesn’t work for me to the extent that when I eat crumbs upon crumbs upon crumbs I don’t take in hundreds of calories and gain weight, particularly in the hip and thigh region. But I choose to believe it and like to believe it and share the theory with the world, because my Mama told me so. Tags: anniversary, Buttercup, celebration, Crumbs, Cupcake Cafe, cupcakes, Junior's, Magnolia, memories, mother, Zaro's. Bookmark the permalink. Previous post ← Cupcakes & Cat Food?? ?